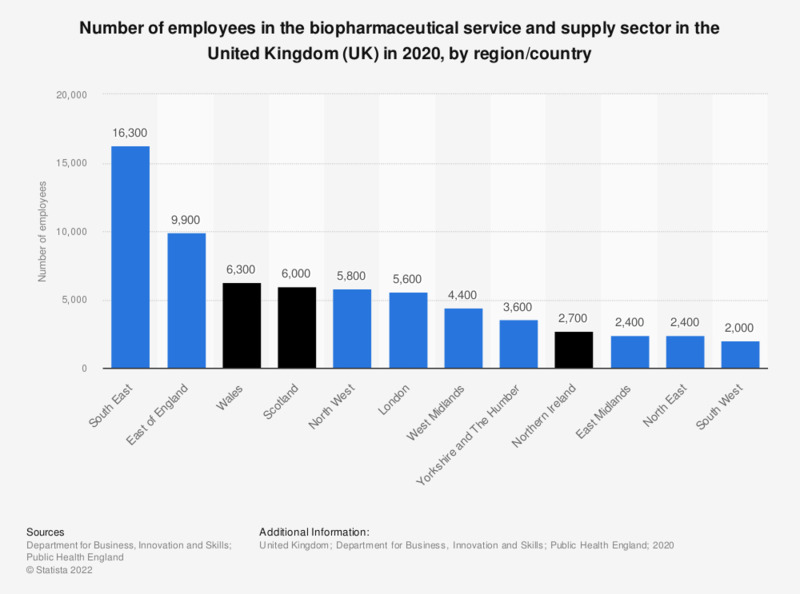 This statistic displays the number of employees in the biopharmaceutical service and supply sector in the United Kingdom (UK) in 2017, by region. The biopharmaceutical service and supply sector encompasses research and manufacturing companies as well as logistics and financial services to the biopharmaceuticals sector. In 2017, the south east of England had the highest number of people employed in the biopharmaceutical service and supply sector at over 12.3 thousand people. This was followed by the east of England at 9.1 employees. The region of the United Kingdom with the lowest number of employees in the biopharmaceutical service and supply sector was the south west of England at 2.4 employees.